Pick 4 Marauders Packs and get a FREE Command Pack! 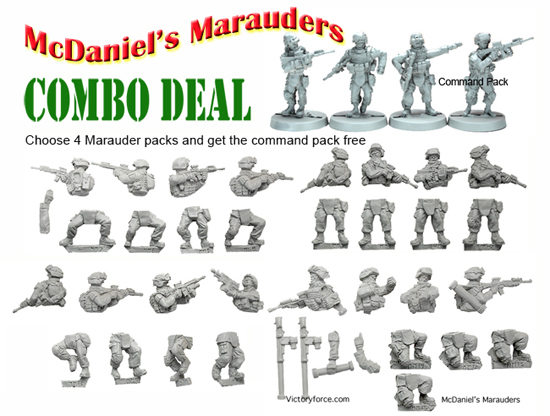 Mix and match the U.S. Marine upper torsos (armed with M16′s (holding, firing, grenade launchers), SAW’s, SMAW’s, and M240G’s) to the lower leg portions (standing, assault, running, and kneeling) and create a variety of figure poses. Find it in the Specials Section of the Victory Store for a limited time. Subject to end without notice. Not valid with coupon codes. To compare the packs go here, but you must choose the special to get the special price and free pack.